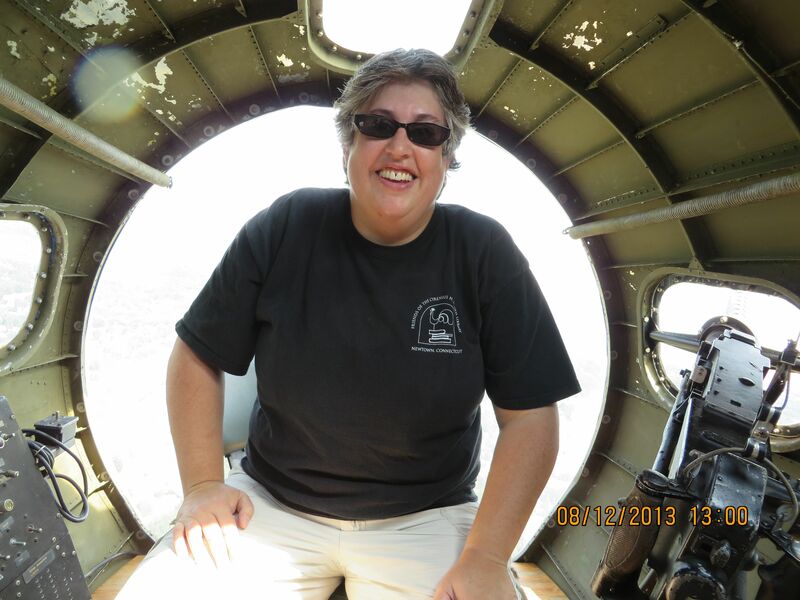 Here I am in the nose of a B-17. Bombs away! Hi. I’m a native New Englander. I wrote a bunch of my funny childhood stories as a Christmas present for my 80-something parents in 2011. They loved the gift, and we all enjoyed the happy and humorous moments that had provided dinner table laughter for so many years. Sadly, my mother passed away less than eight weeks later. I decided that I wanted to re-write the stories and publish them as a tribute to my parents. The project has grown over the last couple of years and I’ve now added both my mother and father’s lives into the book. My father was from Stratford, Connecticut; my mother was from San Antonio, Texas. Thousands of miles apart, they were both children of the Great Depression and experienced World War II. My father was drafted and served U.S. Army Air Corps, trained as a B-17 tail gunner; my mother served as a Jr. WAC. They met as fellow educators at Staples High School in Westport, CT. I grew up in Newtown, CT and attended the public school system K-12, including Sandy Hook Elementary, Newtown Middle School, and Newtown High School, graduating from high school in 1985. Newtown is known to everyone now. If anything, I hope readers understand that small town New England roots really mean something. Once a Newtowner, always a Newtowner.